2019 Calendar Is Up And Ready! The conference is daring to go where no other grouping will go, with an invitation-only segment for one on one connecting with top music industry folk. 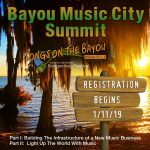 March 25-31, 2019 marks the week of the annual Bayou Music City Summit and Songs On The Bayou Songwriters Festival, a conference that will soon become one of the main events of the year. Set in Morgan City, LA with musicians, music industry folk, and participating companies who will be on hand to perform and answer all of your questions – all nestled in the Morgan City Municipal Auditorium and various venues around the small city. The conference will cover topics from mechanical to business logistics to the latest in resources for every level of the musician’s need in the evolving music business. Over 100 songwriters are performing in 11 venues in Morgan City, LA with various spotlighting programs; Fais Do Do at Lake End Park, Bayou Sunset Picking Party, SwampPop night and a Young Songwriters event so there will be plenty for all to take in. The Last Honky Tonk Music Series: Since its humble beginnings, the series has kept its focus on the artist with its motto: Sustain The Artists, Sustain The Venues, Sustain The Communities. KQKI (95.3 FM – Morgan City, LA) on Sundays with Brigitte London – for The Honky Tonk Hometown Radio Show – 3 hours of great music! Developed in memorial of country singer-songwriter Wayne Mills, 44, who was murdered back in 2013 in Nashville outside a bar in the “Lower Broad” tourist section of Music City. The series was to carry forward the ideals of an independent musician that he truly believed in. He was memorialized by a close friend, singer-songwriter Brent Cobb, in his song, “King Of Alabama” off of his 2018 release, Providence Canyon. The late musician never had any huge commercial success, but he had a great circle of friends like Blackberry Smoke, Blake Shelton and Jamey Johnson whom he had shared stages and shows before his untimely death. Since the series inception, D.a.T. SaUcE has been a great sponsor for The Last Honky Tonk Music Series, keeping the fires alive on stage and in your mouth. They have a cool take on a hot sauce for its blend of Cajun, and Southern Louisana flavors made the old fashioned way. A family-owned business since 2012, they are the proud national sponsor of the Last Honky Tonk Music Series, and have spread the joy of hot sauce from 1,000 stores all the way to our U.S. Troops! Concert Of Light: Scattered throughout the year, special evenings, called Concert Of Light when the talented songwriters of The Series, come together on a larger stage to honor our country’s military veterans. This is a full non-profit event with 100% proceeds going to the families through the R & DA Military Assistance Program. A July show is slated at the National Cathedral so stay tuned for more info on that. Founder Brigitte London and her team are busy getting ready for you and can’t wait to get rolling with this year’s events. So, pencil it in, save the dates and get packing! Steve Conn: your favorite musician.